You are currently browsing the tag archive for the ‘Marrickville Council’s Draft Biodiversity Action Plan’ tag. Google map of AB Croft Playground & the Dibble Avenue Waterhole. Being so close to the habitat provided by the Marrickville Golf Course & the Cooks River makes the waterhole a fabulous & important wildlife refuge. 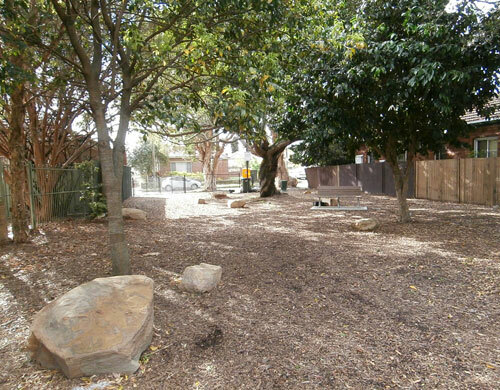 Dibble Avenue Waterhole Marrickville – looking lovely & much cleaner after recent works. For those of you who haven’t visited this public green space in Marrickville, the AB Croft Playground & Dibble Avenue Waterhole belong together. AB Croft Playground is a small park that allows you to view the Dibble Avenue Waterhole, unless you are lucky enough to live in a property that overlooks the Waterhole. The feeling of this small park is trees, which is really nice. There is a massive tree just inside the entrance & other smaller trees in the park & around the perimeter. The canopy of a large tree growing in the property next door cascades over the park adding to the sense of leafy green. I have not come across a park in Marrickville LGA that has so much shade & this is something I appreciate. AB Croft Playground was a bit dismal before the recent upgrade. 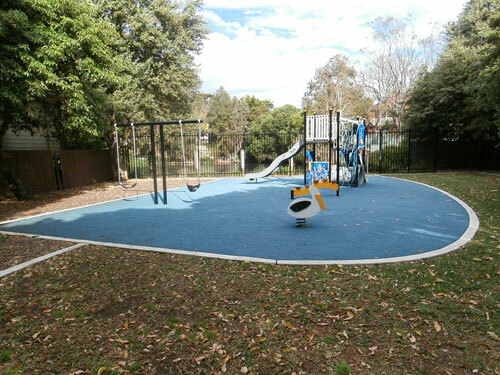 Marrickville Council has created a lovely happy playground right next to the waterhole in an area that gets sun. The playground has swings & climbing equipment & all this is on a large base of soft sky blue rubber material that imitates the waterhole; at least that’s how I interpreted it. There are two new park benches & many large rocks have been positioned throughout the park to allow children to climb over them & to be used as seating. 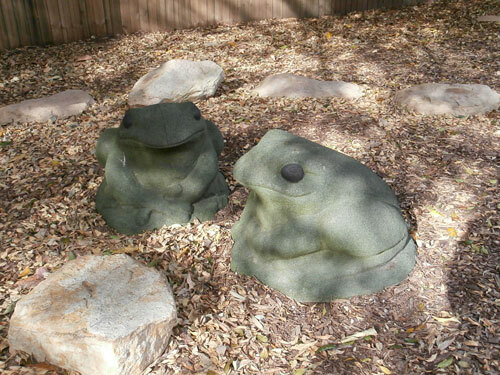 In one circle of rocks are two new large green-coloured concrete frogs. I imagine younger children would like to play on them. Apart from the dumping beside the rubbish bin at the entrance, there was no litter to be seen in the park, which was another plus. 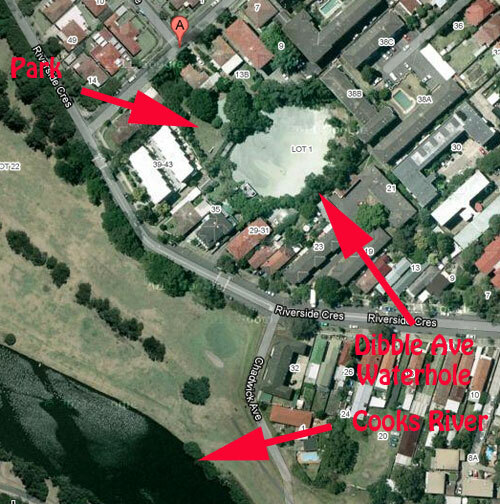 Also highly unusual, Marrickville Council has not created a concrete path into the park. Instead they have used mulch to a level where it was easy to walk across with bicycles, so prams would have no trouble either. Having one’s feet walk on the earth was how parks were in my childhood & no harm was done. In October 2010 I wrote about the Riverside Crescent Subcatchment Management Plan 2010 which targeted the Dibble Avenue Waterhole. 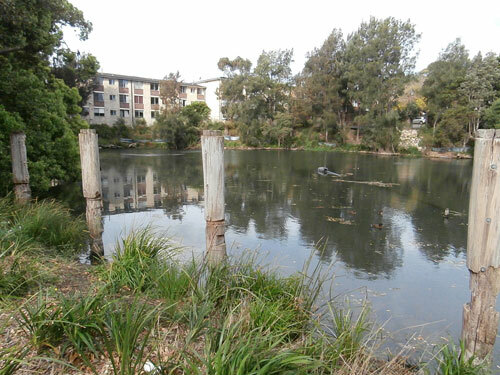 In August 2011 I wrote again about the Waterhole as it was included in Marrickville Council’s Draft Biodiversity Action Plan. Spending $10,000‐$30,000pa on increasing the density of vegetation around the waterhole. Commencing a community monitoring program. I did not see any bat boxes, but they could be there hidden in the trees. There is a new fence between the park & the waterhole to ensure safety. It also looks good & unlike the previous fence, allows both adults & children to have a clear view of the waterhole. Bring your own seats though. There are plenty of resident ducks & other waterbirds to keep everyone interested. Obviously the fence is there to stop accidental drowning, but it also allows people to be involved with nature while keeping the wildlife safe from people. This is important for the birds as they have very few genuine safe refuges locally. Council has removed the old decayed pier leaving the pier stumps for interest & I presume as a link to the history of the Waterhole. The pier stumps also make great perches for birds to sit. I was very pleased that the large Camphor laurel tree was still standing. Council had said that they intended to remove it. The tree provides much shade for the property it grows next to & now has branches cascading over the water, which is quite lovely & important for many birds. The property it shades is full of large canopy trees so it is easy to assume that they do not mind the shade & privacy the tree provides. It is also quite beautiful. I know some people don’t like Camphor laurel trees, but they are not spreading into Wolli Creek or along the Cooks River, so the benefits of having a large tree in an urban situation far outweigh removing it in my opinion. Quite a few non-native trees were removed from around the waterhole & what remain are mostly Casuarinas & these will spread in time. 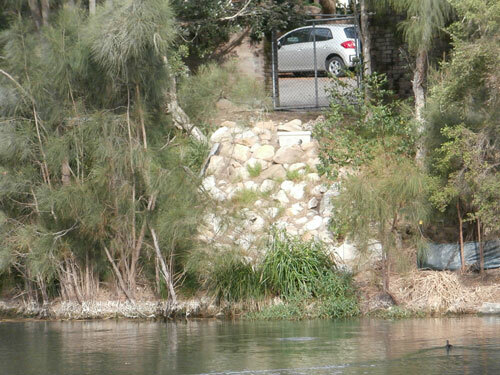 Council has shored the sloping banks of the waterhole to stop soil erosion & planted many native grasses. Council has also built a swale from what appears to be a private carpark to slow down & filter stormwater before it enters the Waterhole. The water was considerably cleaner than it has been on previous visits. There is a floating barrel with a thick pipe attached that goes to the bank & out of view. I would not be surprised to learn that this is some sort of algae filtering system. I think the Dibble Avenue Waterhole is a jewel in Marrickville & was happy to see that it is now looking good & cared for. It is on the historical trail of Sydney so this is another important reason to keep it looking its best. To have such a place that is essentially a wildlife refuge area surrounded by houses is quite unique & very special. The lovely new playground in AB Croft Park. The blue surface is very soft to walk on. View of AB Croft Park towards the entrance. There is a wonderful tree in the centre. It would be nice to see some shade-loving plants around the trees & along the fence line. Showing the new swale that will filter stormwater before it gets into the Waterhole.